Linaro Uses Cambrionix Technology for 24/7 Error Free Software Testing - Datamation Systems, Inc.
Linaro is the open source collaborative engineering organisation leading development of software for the Arm® ecosystem. It aims to bring together industry and the open-source community to develop new technology, reduce industry fragmentation and duplication, and provide common software foundations for enterprise, networking, digital home, mobile and Internet-of-Things applications. Members comprise many of the world’s leading technology businesses including Arm, Cisco, Comcast, Google, HiSilicon, Qualcomm, Red Hat, SaneChips, Socionext, Spreadtrum, STMicroelectronics and Texas Instruments. Linaro has a sophisticated automated testing laboratory called the LAVA Lab that is being adopted as a standard test framework by companies around the world. LAVA (Linaro Automated Validation Architecture) is Linaro’s home-grown testing architecture. The local development and centralised testing lab in Cambridge has around twenty, 42u racks for testing a wide variety of Arm devices and hardware platforms from credit-card sized circuit boards for mobiles to large-format boards used in servers. Over 50% of the target devices rely on USB connections for testing. 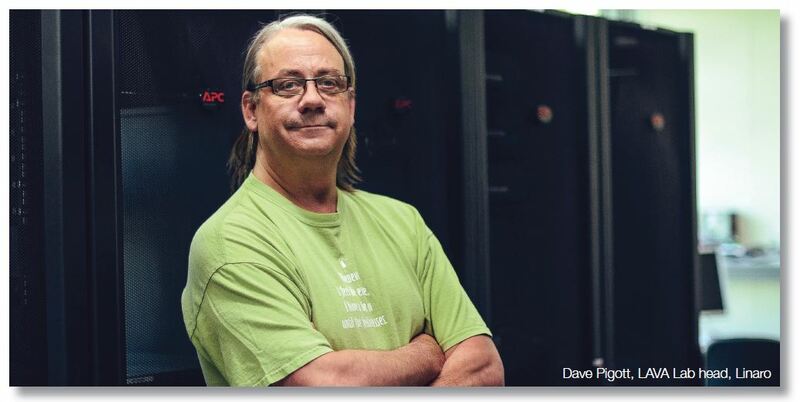 From the outset, when Linaro was set up in 2010, it struggled to find reliable USB hubs offering external control and the capability to withstand rigorous and Case Study Linaro Dave Pigott, LAVA Lab head, Linaro demanding LAVA Lab testing requirements. As the volume and complexity of work undertaken by the lab grew, problems around USB con trol and connectivity became increasingly costly and time consuming. Dave Pigott, head of Linaro’s LAVA Lab, says, “The main problem was reliability. We’d buy a range of hubs from basic cost to more expensive ones, but we found that eventually all would start to develop faults. They wouldn’t deliver full power on every port or a fault would cause a server problem, resulting in a server reboot. Another problem was that if you wanted to charge a device and run some tests, the device would often drain power faster than it would charge. We also needed the ability to control each port individually and there was simply nothing on the market with that capability.” Pigott and his team had even resorted to a Heath-Robinson-like solution of cutting a USB cable and connecting up to a Raspberry Pi computer to gain some level of power control. While researching for a better solution, one of the LAVA Lab team came across Cambrionix – a local business that was fast making a name for itself as a pioneer of USB charging technology. 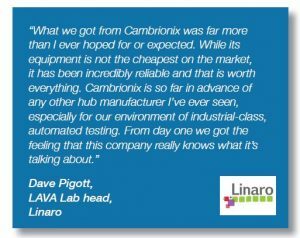 Linaro approached Cambrionix, started testing its USB hub equipment and was instantly “blown away” by its capabilities. Pigott says, “What we got from Cambrionix was far more than I ever hoped for or expected. While its equipment is not the cheapest on the market, it has been incredibly reliable and that is worth everything. Cambrionix is so far in advance of any other hub manufacturer I’ve ever seen, especially for our environment of industrial-class, automated testing. From day one we got the feeling that this company really knows what it’s talking about.” Linaro has replaced all of its existing USB hubs with around thirty Cambrionix devices and is now setting up a number of advanced technology projects that are likely to see the number of Cambrionix products it uses more than double over the next two years. Linaro is using the Cambrionix PowerPad15S, which is a compact unit designed to connect and charg e 15 USB devices with a single host computer. It is specifically designed for industrial standard testing environments and is over-engineered to provide both high-current charging as well as robust data transfer to the host. Linaro has also started to deploy EtherSync technology for managing and charging USB devices over Gigabit Ethernet LAN/WAN.